Clean your electric golf trolley or golf push cart frame components using a damp cloth. You may want to use a brush for the wheel treads. For electric trolleys, particularly, DO NOT use a hose or power-washer to clean your cart. Keep moisture away from battery connections and the electronics in the handle and controller box/compartment! Periodically lubricate and protect the axles and wheel cores from oxidation with WD-40 or similar lubricant. At least once a season, we recommend the wheels be removed and use a soft cloth to clean off any grit or debris. Store your golf trolley or golf push cart in a way that will keep it from getting inadvertently damaged. For extended storage, we recommend the cart be covered to keep out dust. A good way of protecting against dust and protecting your car trunk from grass dirt and other debris is a carry case. Browse the accessories page on our website to view a selection of carry cases designed to fit your cart. 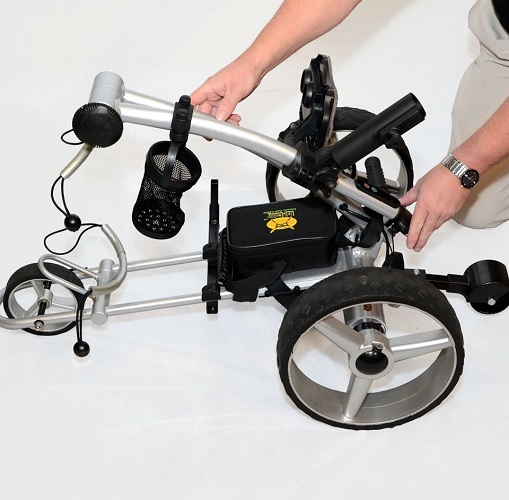 For information on the care of batteries, see the article - Electric Trolley Battery Care Tips. Best Wishes for Great Golfing!